There’s something so fresh and bright about lemon desserts with a perfect tang that we think balances out the sweetness yet soothes a raging sweet tooth. Today we are sharing just a few of our favourite lemon desserts to help you get inspired by these best tangy treats. We have all heard the saying “When life gives you lemons….” you can make any one of these! Where did we find all these yummy lemon desserts? *each of the highlighted links will take you directly to the recipe and have been tested to make sure they work so, if you find a glitchy one let me know! Well there you have it, friends! 15 delicious lemon desserts that could keep you busy baking for DAYS! With so many to chose from it’s hard not to do all of them. My mouth is watering already! Which dessert is your families favourite? Do you have a Lemon recipe not listed here that we should try? I really love the sweet and tart combination lemon desserts have to offer. Lemon Cheesecake squares are simple the best. You can’t go wrong with a good citrus recipe in the dreary days of winter. Lemon desserts are my favorite. Lemon anything really. Thanks for rounding all these up now I need to find the time to bake them! I happen to love lemon desserts. This is a great collection…now I feel like making a pie!! I love Lemon desserts. Not sure which one to try first – they all look delicious! 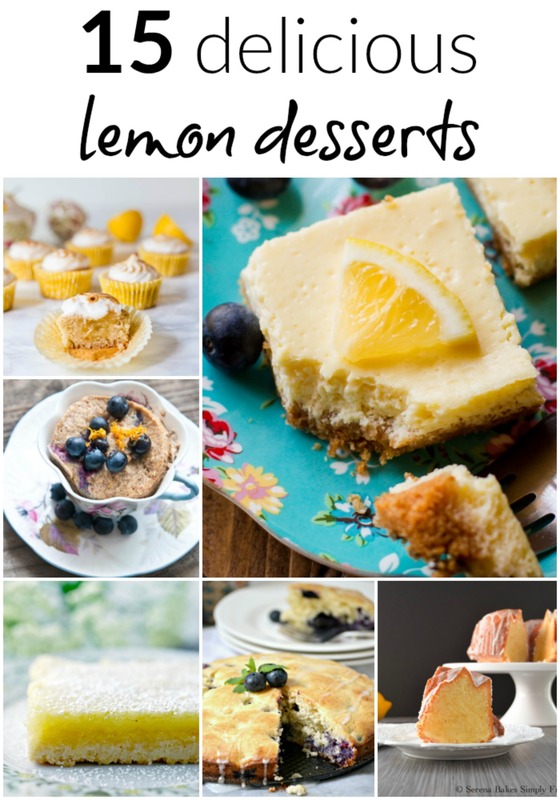 I haven’t had many lemon desserts as my first choice, but since hubby loves lemon, I will be definitely checking it out, to try some of them! . Mmmmmmmm. Lemon desserts. Have you ever heard a more delicious combination of words! I see quite a few treats I would like to try. These ideas are totally making me crave that flavor. A lemon strawberry shortcake trifle would be amazing right now. I haven’t had very many lemon desserts as my first choice is usually chocolate. I think I would LOVE these though! Pinning for later. WE love Lemon desserts in our family. Lemon cookies are a favorite!! And my son always asks for lemon cake for his birthday! Yummy!! I love lemon, it is one of my favorite fruits in desserts. They all sound refreshing. I love lemon desserts! I find that many can easily be gluten free! We love lemon flavor! I can’t wait to try a few of these recipes. I love lemon desserts and am always looking for great recipes. There are lots on this list to choose from. I used to have a lemon tree in my yard, I could’ve use these recipes back then. I love fresh lemon taste so good and a dessert. I will have to try some of these. That’s what I was thinking too. All of them. 🙂 Lemon makes me happy.